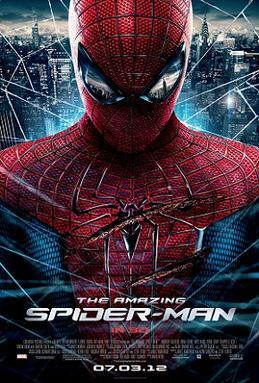 I’m usually several months or even years behind in my film viewing, so I only recently got around to watching The Amazing Spider-Man, released last summer. Oh sure, Andrew Garfield serves the role of Peter Parker/Spider-Man well. He’s a worthy successor to Tobey Maguire as a science nerd and impetuous but well-meaning dork—an ordinary guy. And the film updates Spidey’s costume and features rapid-fire action sequences, humor, and pathos—all necessary ingredients for a Spider-Man movie. It’s adorned with veteran actors (Martin Sheen, Sally Field, Denis Leary) in supporting roles, and it’s got a mean and nasty villain (The Lizard this time, instead of The Green Goblin) who earns both our sympathy and hatred. But in spite of boasting everything a modern super-hero film should have, The Amazing Spider-Man plods along like an emotional flat tire. All the classic elements of Spider-Man’s origin are still there. Peter bitten by a radioactive spider—check. Peter being picked on at school by Flash Thompson—check. “With great power comes great responsibility”—check (though clumsily reworded). Murder of Uncle Ben—check. The filmmakers of The Amazing Spider-Man must have composed a similar laundry list. They kept what they had to but changed or altered whatever they could in order to distance the new film from the Maguire franchise. The most obvious change is the substitution of Mary Jane Watson with Gwen Stacy. This change adheres somewhat closer to the original comics (Gwen was Peter’s girlfriend before Mary Jane), and, though there are obvious differences between Gwen and MJ (one's a blonde, the other's a redhead; one's a brilliant science student, the other an accomplished actress), it still felt as if one cookie-cutter high school sweetheart was substituted for another. Police Captain George Stacy, Gwen's father, also figures prominently in the film, and fans of the comics should feel ashamed if they don't know exactly where this is going. Never mind. Denis Leary is fun to watch. But most changes seem arbitrary, such as the manner in which Uncle Ben dies. Yes, there is still a shooting and a robber, and Peter still feels horribly responsible. But the filmmakers strained to make this pivotal event as “different” from past accounts as possible. The result is like eating stale cake with fresh frosting. And therein lies the fatal flaw of The Amazing Spider-Man: It takes few risks except for superficial and ultimately meaningless ones. The most successful super-hero films of the last decade or so (Spider-Man, X-Men, The Dark Knight) dug deep into the well of each character and drew out a gusher of new potential. They didn’t “update” their heroes so much as they highlighted their universal and timeless qualities. The Amazing Spider-Man tries too hard to be now. When a major character dies (which happens twice in this film), we’re supposed to feel something, but I did not. When Peter struggles to keep his promise to one character, we’re supposed to sense his inner nobility, but neither the struggle nor the nobility are present. Instead, it is the villain who comes off as more noble, more heroic in the end. So this film is like the socially inept kid who wants to hang out with the “cool” kids but thinks the wrong things are cool. He’s all flash and no substance. For your Spidey film fix, rent the first two Maguire films instead.